I’ve been wanting to do this Irish staple for a long time. Simple but nice and filling. I had to add some kind of meat to turn it into a full meal. In this case, scallops. Because, that’s what I have available. I added a little ground mace to the flavor just so it wouldn’t be just another mashed potato dish. It does add a hint of nutmeg, not much but enough to make it different. I love it! Prep everything before you start cooking. Boil the cubed potatoes in a pot of salted water until soft, about 20 minutes. In another pot, also with salted water, boil cabbage until soft but not mushy, about 10 minutes. Drain water and set aside. Cook the bacon in a pan to crisp. Transfer to a plate lined with paper towel and let it rest and drain excess grease. Season the scallops with ground mace and salt & pepper. Take most of the grease out of the pan and sear the scallops in medium-high heat for about 3 minutes on each side. Be careful not to overcook them. Set aside on a plate. In the same pan, bring the heat down to about medium-low and sauté the garlic and leek for a few minutes or until leek is translucent. Turn the heat off. When potatoes are done, drain the water then add milk, butter, a dash of ground mace and salt & pepper to taste. Also, add the sautéed garlic and leek to the mixture and start mashing until everything is fully incorporated. You might want to see if you need more or less milk than 1 cup. But you want the mash nice and creamy, not dry. Now, stir in the cooked shredded cabbage. Finally, add in the crumbled bacon and parsley and fold evenly. 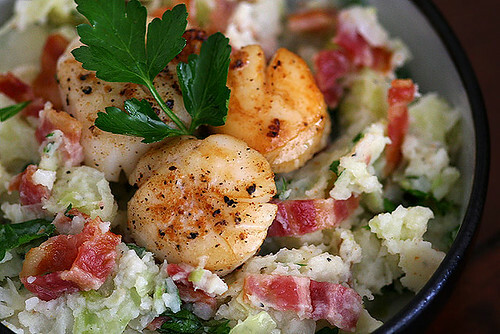 Serve in a soup bowl and top with scallops. And if you want. garnish with more parsley and crumbled bacon. Years ago, I had a Japanese roommate. It was from him that I learned of Japanese cuisine beyond the confines of California Rolls. One of the dishes he used to make for dinner is Tonkatsu (I can still hear him pronounce it with an authentic accent). 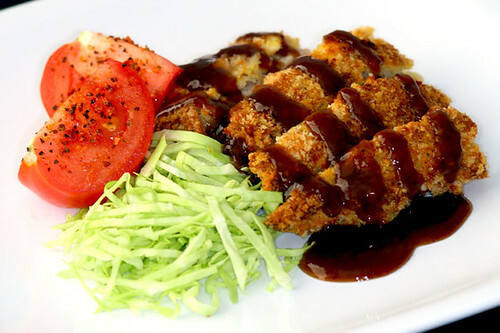 A suspiciously easy meal to prepare, yet the combination of the panko smothered pork chop and shredded cabbage is just hands down, one of tastiest fare you’ll ever get to try. Also, I baked it instead of going the usual deep fry method. Trying to be health conscious here, people. Oh, but the sauce… the sauce!!! if I can only gulp it down, I would. Directions: Season chops with salt and pepper. Dip in flour, then in egg wash, then in panko. Repeat dipping process a second time. Place in baking sheet and bake in preheated 375F oven for half hour or until meat is fully cooked. Shred cabbage and arrange on a plate alongside chops. Garnish with tomato chunks, if you want. Use Tonkatsu sauce as you would BBQ sauce.